When you are shooting closeups, depth of field is always a concern. you really need a small f-stop like f16 or f22 to maximize depth of field . Even in sunny conditions this makes for dark image so, more light is needed. Here is an example of a closeup of a small fly. This was taken with the 105mm Micro-Nikkor and an SB-800 flash mounted on the camera’s hot shoe. I used the SB-800 because it’s flash head can be tilted down 7 degrees and can therefore illuminate close subjects. The onboard flash would have projected it’s light right over the top of the subject. In this case, the bug was close to the path with no interfering vegetation. The exposure was 1/320 of a second at f16. The aperture meant that most of the cluttered background would be underexposed while the subject was correctly exposed by the flash. The total exposure meant that anything in the undergrowth would not be adequately exposed and therefore create a dark background. 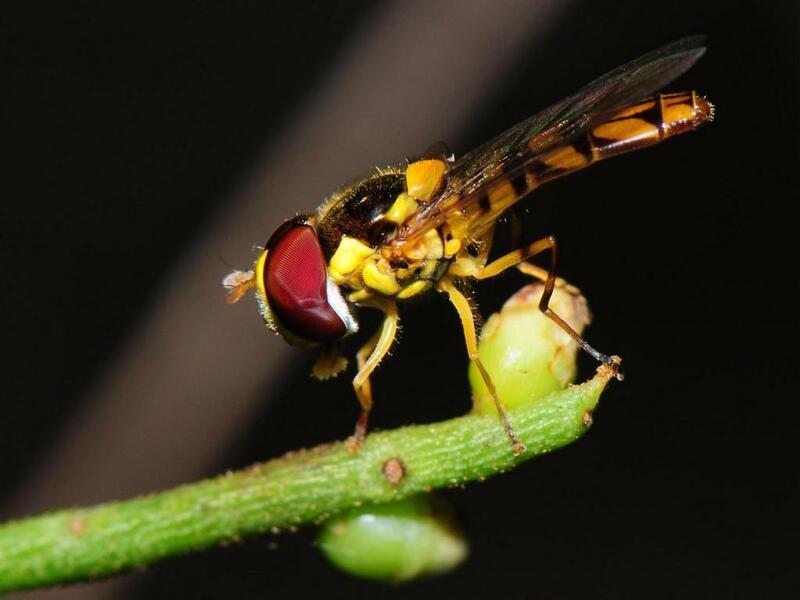 You can see that there was a small twig behind the fly that also received some illumination but, when this occurs, the object is muted by focus and illumination making for an attractive background. One downside with using on camera flash can be seen in this picture and that is the shadow under the flys face which loses some detail. There are a variety of different flash and lighting sources available to closeup photographers. 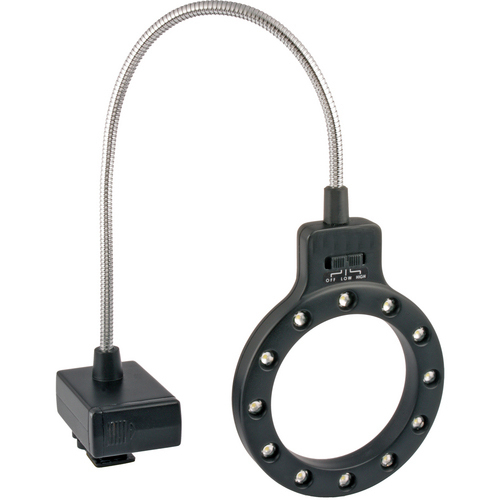 Ringlight is a generic term for a light which surrounds the front of the lens. They may be strobes or conventional bulbs. They come in a number of different configurations. A few of which are shown below. These are three examples of conventional ringlights. They are designed to mount to the filter mounting ring of your lens and most kits come with adapters to fit the different sizes of lenses. The ringlight in the center has a single circular flash tube. Lights like this produce very flat and even lighting which is useful for some types of closeup work like stamps, watch faces, etc. They will also work for lighting three dimensional subjects but don’t provide for any modelling of the subject. The ringlight on the left has two vertical flash tubes. In this model, each tube can be set to provide a different power of light. The flash can also be rotated on the lens to provide the light from different directions shere useful. Both of those ringlights are controlled from a powerpack/interface which mounts on the hotshoe of the camera. 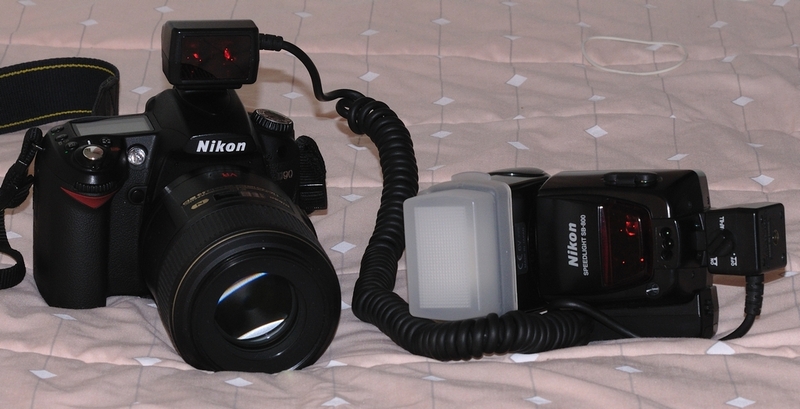 The third picture shows a ringlight with it’s own power pack and is connected to the camera by a flash cable. Probably the most economical is one of the white LED panels which are battery operated and mounted on the lens like a ring light. Here is one example. This one mounts in hot shoe and has it’s own batteries. It extends on a flexible arm so that it will work with most lenses. Others mount to the lens filter ring and need adapters for different lens diameters. Some have two banks so that you can have a more directional light source. If you are just experimenting these might be a good source. One downside is that being a constant light, they may spook some bugs as you try to get close. Another is the potential for the flexible arm to snag if you are shooting in brush. 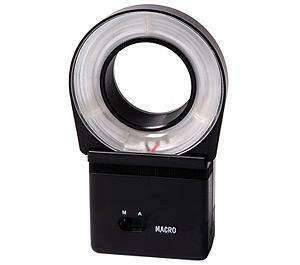 The major manufacturers have developed macro lighting systems for their flashes. 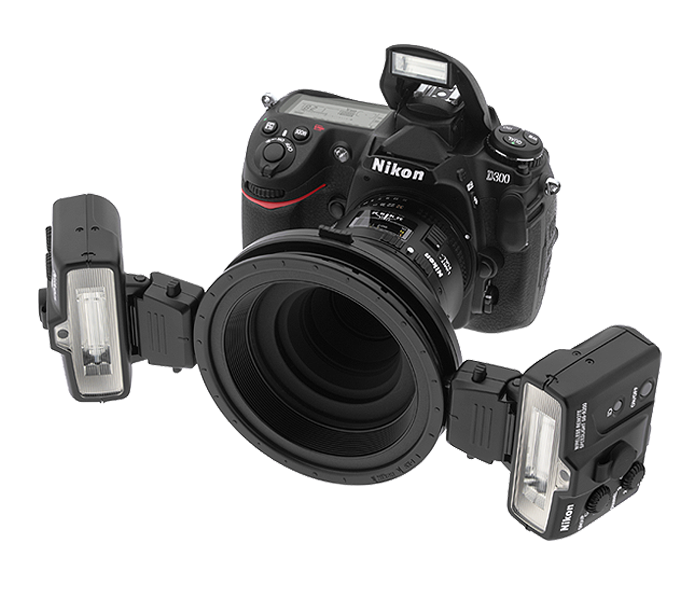 With Nikon, it is a modular system that can support up to 4 small flashes ( SB-R200) on a ring around the lens or 8 of the flashes if it is not attached to the lens (it is a weight problem above four flash units). 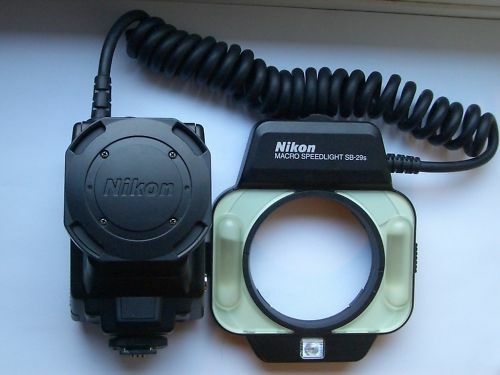 Here is a shot of the basic Nikon R1 Kit taken from the Nikon website. The cameras popup flash is raised because the Nikon Creative Lighting System allows this to act as a controller for the small flashes in advanced models. If you do not have a camera that can operate in commander mode, you would need to buy the R1C1 kit which is more expensive but, includes a controller that mounts in the hot shoe. Canon and Sony offer similar systems for their cameras. Other manufacturers probably do as well. These systems have a couple of advantages. The flashes are further from the front of the lens so, the lighting is coming from a better angle and can provide more modelling when used correctly. Each flash can be independently set for power so you can have a main light and a fill light quite easily. If you rotate from horizontal to vertical, a simple press of two buttons (on the R1) allow the flashes to be rotated as a unit. While the fancy macro flash systems and ringlights are great tools, there are ways you can use one or more of your existing flashes for macro lighting. The main problem with the conventional popup and shoe mounted flashes is that they are designed to put light on the subject at normal focus distances. As a result, they shoot right over a subject that is only a few inches from the front of the lens or cause the lens to cast a shadow over the subject. There are two ways to deal with this, take the flash off the camera or use a relector to bounce light onto the subject from an angle that doesn’t create a shadow form the lens. For example, the Nikon SB-400 is a very compact flash. It’s generally considered useful for replacing the little popup flash on most Nikon DSLRs and the advanced P&S cameras with a hot shot. It has a minimial capability to bounce light. the flash will only tilt upward. This doesn’t help get any flash on a closeup subject unless you create a reflector. 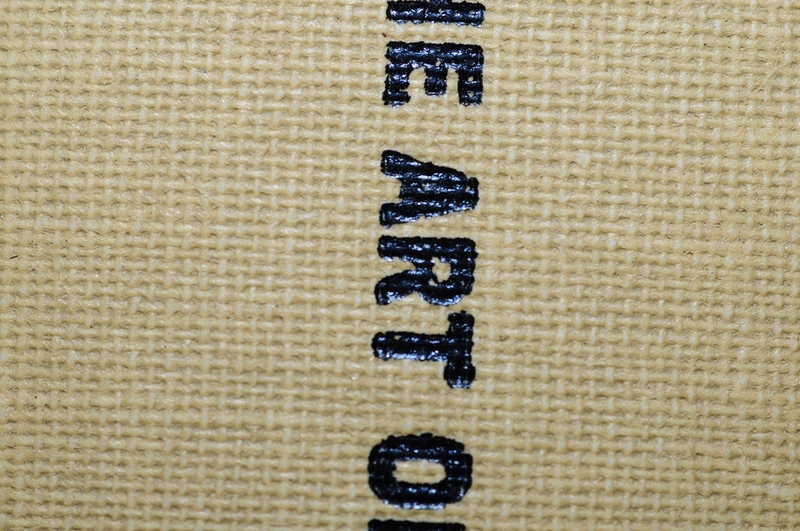 The left image is a reasonably lit closeup of a book spine at approximately 1:1 with an SB-400 speedlight in the hotshoe of the camera. the center picture is the result of using the popup flash with a 60mm AF-D Micro-Nikkor. The shadow of the lens is obvious. The third picture shows the popup with a plain white card held about 1/2 inch above the flash. Because there is no tilt with the popup the card provides a little fill but, the shadow is still obvious. The SB-400 is just that little bit higher that it does not create a shadow with the 60mm F2.8D. Now, for a surprise. 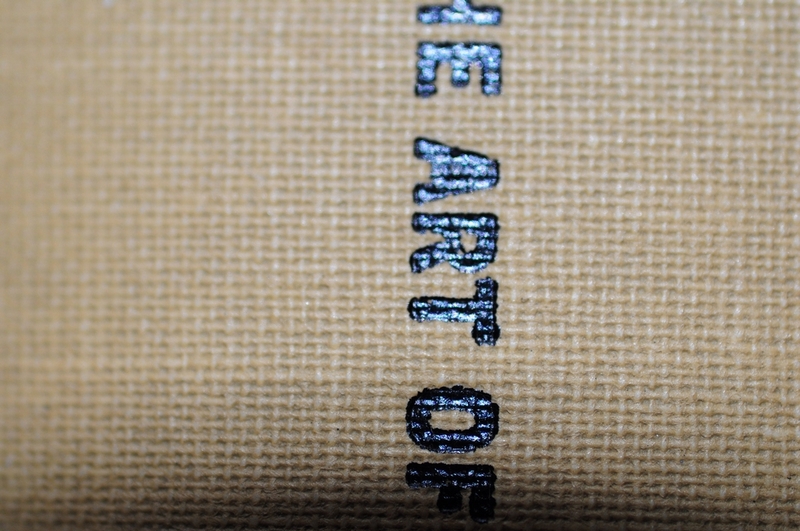 The popup flash does work with the 105mm f2.8 Micro-Nikkor without creating a shadow! The reason is that the 105mm provides a greater working distance at 1:1 and although the lense is slightly longer, the extra working distance makes the popup workable. The best way to get good flash lighting for Macro though is to take the flash off the camera. This allows you to move the light into better positions relative to the camera and subject. There are a lot of different macro flash brackets on the market and they can be very useful for many applications. Here is a post from another photographers blog about a DIY model that might be useful. I’m probably going to build one of these myself. They work fine for bugs in open areas but I am often in very brushy areas where they can be awkward getting fouled on branches. 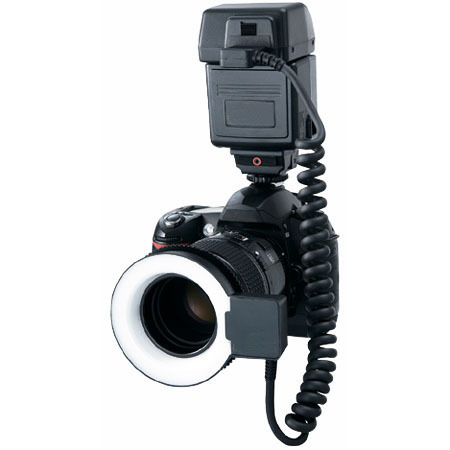 My solution is to use an SC-29 cord and handhold the flash with the camera handheld or on a monopod. I have tried using the popup in commander mode but, the command preflash can spook the subject before the exposing flash takes place. You could work cordlessly if your flash had an SU-4 or similar slave mode. In fact, there are a lot of slave flashes now being sold for Point and Shoot cameras that could be very useful. They aren’t too powerful but, in macro situations, that isn’t really a problem. 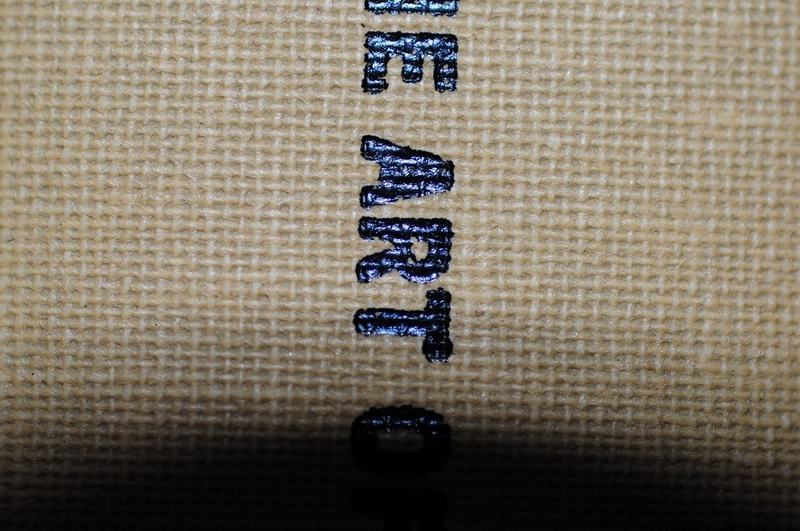 This entry was posted in Bug, Camera Gear, Camera primers, Shooting closeups and tagged Photography. Bookmark the permalink. I own a D300 and I also have the Nikon 105mm VR Macro lens. I have been trying to do bugs macro shot but the DOF is very narrow with macro lens so you end up not having enough shutter speed and also not enough light. This week I bought the SB-900 and I was thinking to also using it for macro with my 105mm. I was thinking about the R1 but I want to have a more versatile flash with more power and use (other than macro). You are using a SC-29 cord hook to your SB-800. When you use the SC-29 does the flash (SB-800 and SB-900 in my case) still do the preflash ? When I the SB-900 on the D300 it make preflash before shooting, but I think it’s because of the TTL but i’m new to flash so I have alot to learn using flash. So how do you prevent the preflash with the SC-29 ? On your SB-800 do you use big diffuser (DIY) any link. Or you are using the diffuser that come with the flash ? I sometimes use the diffuser that came with my SB-800 but most often do not. I put the camera in manual mode and the flash in TTL-FP. This allows me to set the shutter speed to 1/200-1/400 and the aperture to f11 or f16. The TTL function will determine what amount of light that the flash needs to produce and the FP function will cause the flash to produce enough light for the shutter speed. This isn’t foolproof but, it’s a good start and you can adjust the aperture if the image is a little too dark.